RIA Novosti (one of the largest news agencies in Russia) published an article about the humanitarian crisis in Ukraine, citing outlandish claims of pro-Russian terrorists. Direct quote used in the article alleged that 180 members of Ukraine’s National Guard were found with their stomachs split open and 300 more bodies were located nearby, with all of their internal organs missing. 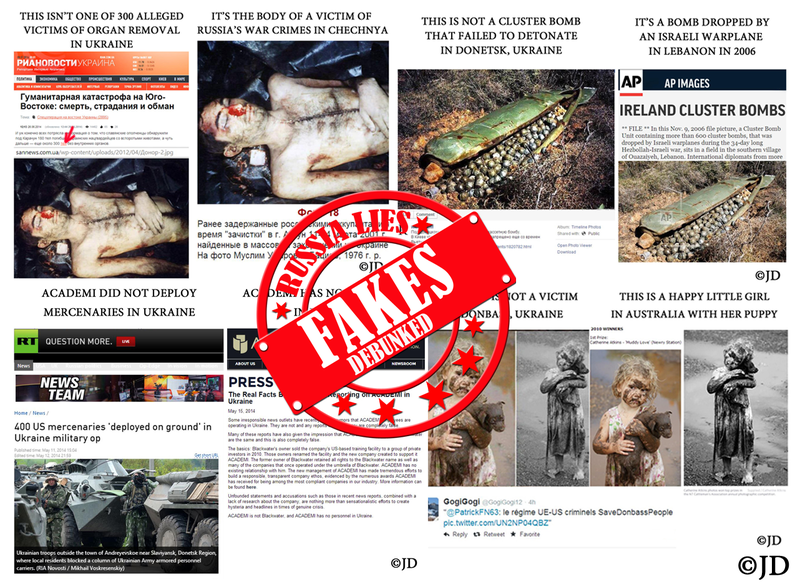 Since there were no real photographs to corroborate this assertion, in mentioning 300 disemboweled bodies, RIA Novosti linked to a graphic image that in reality has nothing to do with Ukraine. In fact, it’s one of many images of Russia’s war atrocities in Chechnya. 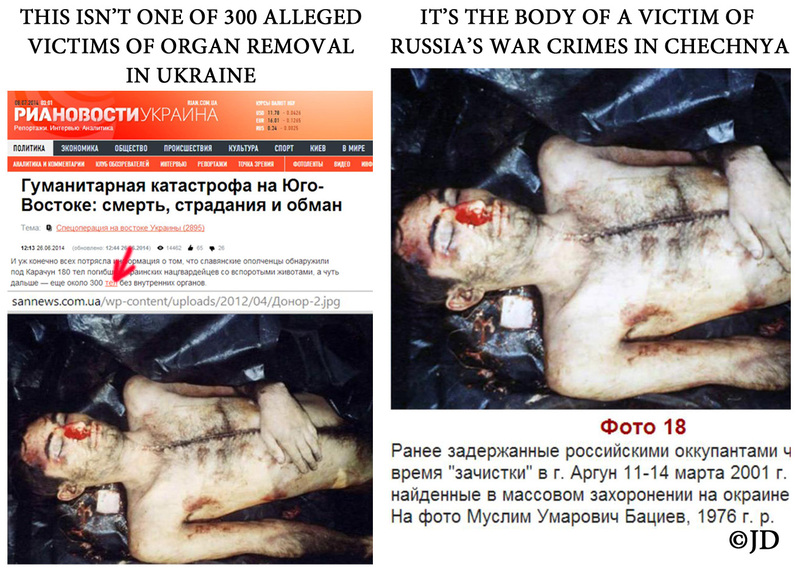 Fake “news” of alleged organ harvesting in Ukraine (often accompanied by the same unrelated photograph) continue to spread like wildfire all over the Internet. 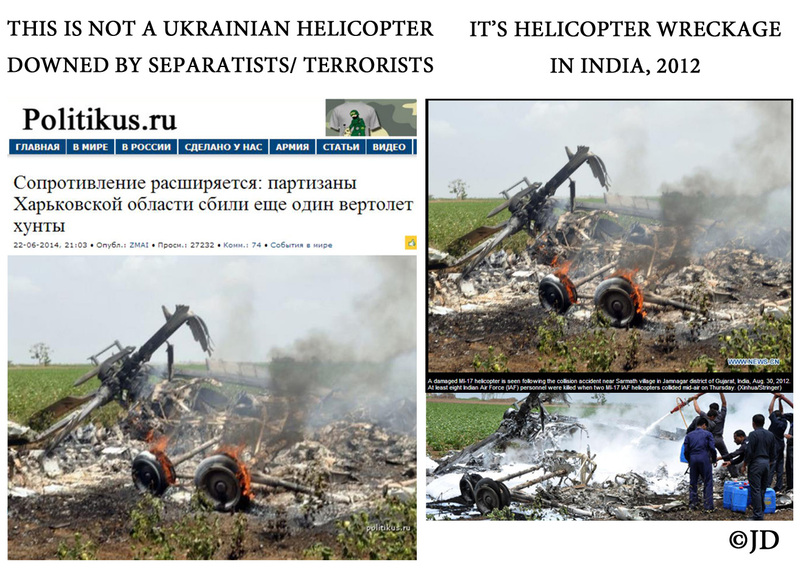 Rejoicing over the “news” of another Ukrainian military helicopter, allegedly downed by pro-Russian terrorists/separatists on June 22, 2014. Politicus.ru published an article, accompanied by the photo of what allegedly remained of the said helicopter. In fact, this photograph depicts the outcome of an aerial collision near Sarmath village in Jamnagar district of Gujarat, India on August 30, 2012. Jen Psaki became one of the favorite targets of the Russian media. 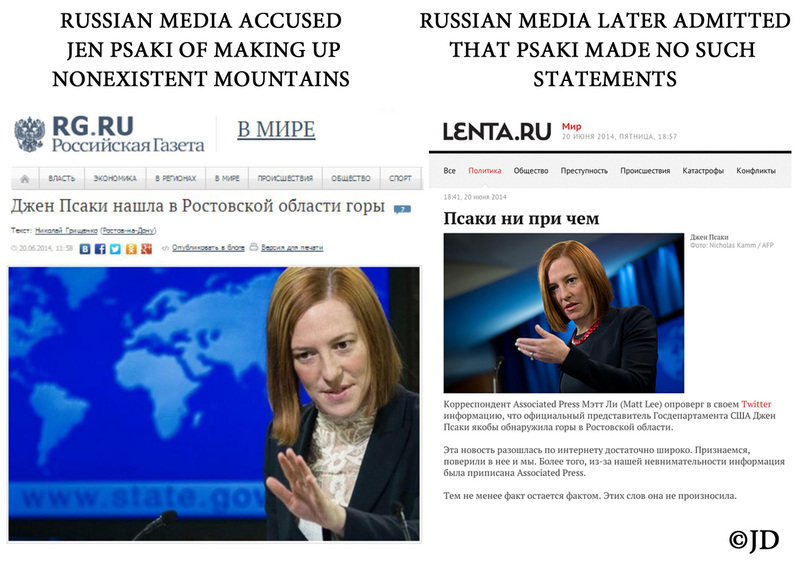 RG.ru published an article entitled “Jen Psaki found mountains in Rostov Oblast.” The article attributes direct quotes supposedly obtained by journalist Matt Lee about Ukrainian refugees to Russia, whom Psaki was said to have referred to as “tourists traveling to enjoy Rostov’ mountains.” Matt Lee promptly denied ever having such a conversation with Psaki, asserting that the claims in the article were false. In spite of Lee refuting claims in the article, the same allegations were regurgitated by Komsomolskaya Pravda and other news outlets, some of which attributed the fake quotes to Associated Press. Lenta.ru published an apology to Jen Psaki for re-printing the said false claims. None of the other outlets apologized, but instead went on to pontificate about Psaki’s prior commentary, continuing to attack her credibility. 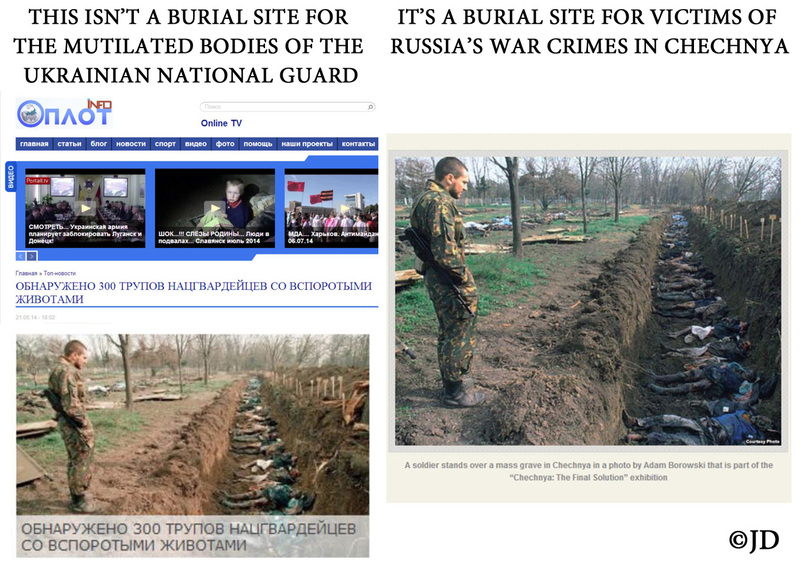 Numerous Russian news websites, bloggers and social media users spread the fake “news” about the disemboweled bodies of 300 members of the Ukrainian national guard that were allegedly found by pro-Russian terrorists/separatists in mass graves. The photo that was repeatedly used to illustrate this gory fantasy was taken from the archives documenting Russia’s atrocities in Chechnya. Russia’s raconteur-in-charge Vladimir Putin harshly denied that Russian troops had anything to do with the annexation of Crimea. After the Anschluss, however, Putin admitted that he lied, confirming that Russian military took active part in the unlawful annexation of Ukrainian Crimea. 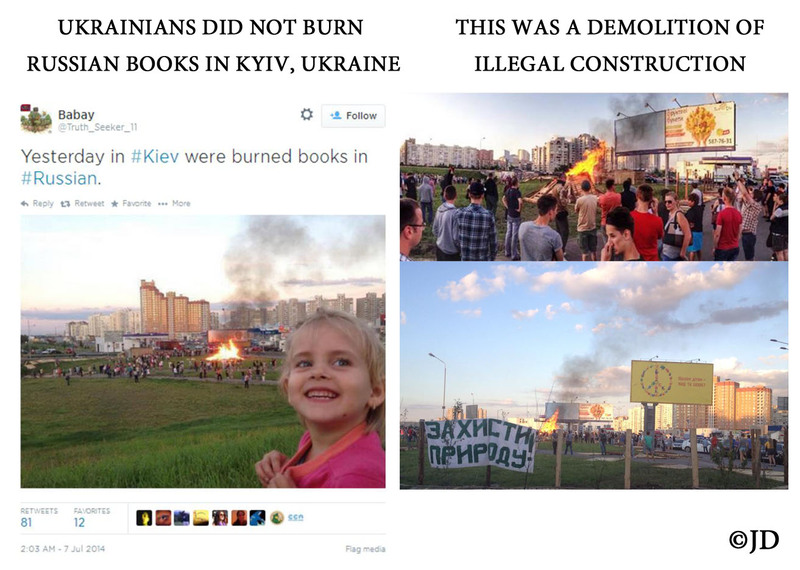 Numerous Russian sources spread misinformation about Russian books allegedly being burned in Kyiv, Ukraine on July 6, 2014. In fact, no such book-burning took place. 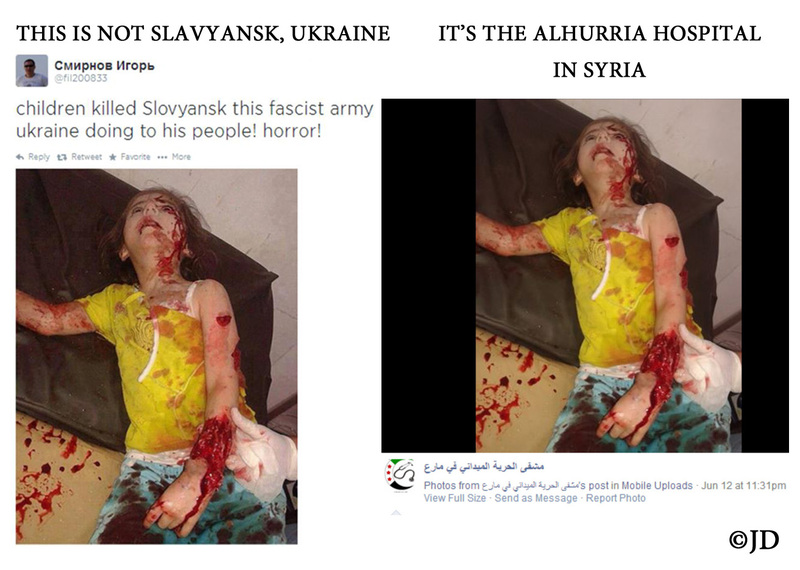 Photos used to corroborate this fabrication were related to the demolition of illegal construction materials in Kyiv. This graphic photo of a little boy was represented to show the child allegedly injured due to the Ukrainian military’s shelling of civilians. 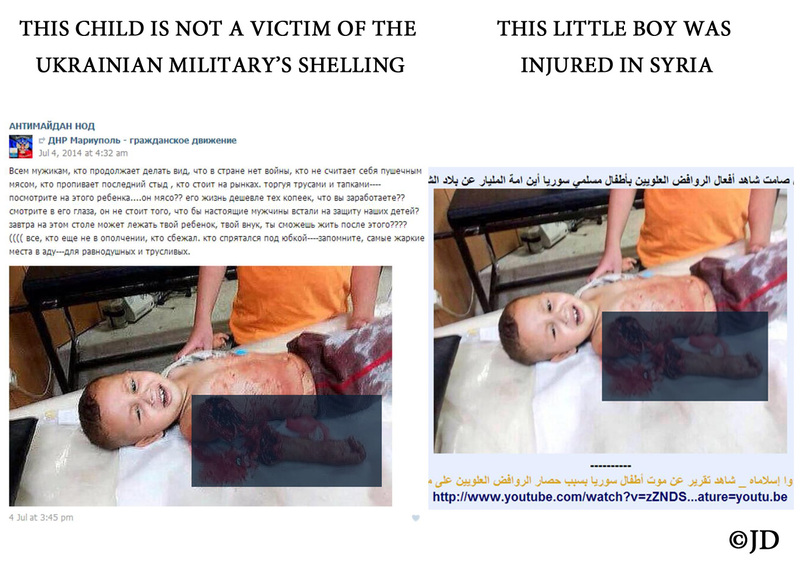 In reality, the picture depicts a child injured in Syria. Photograph of a cluster bomb was used to corroborate an allegation that it was allegedly dropped by the Ukrainian military, but failed to detonate in Donetsk, Ukraine. 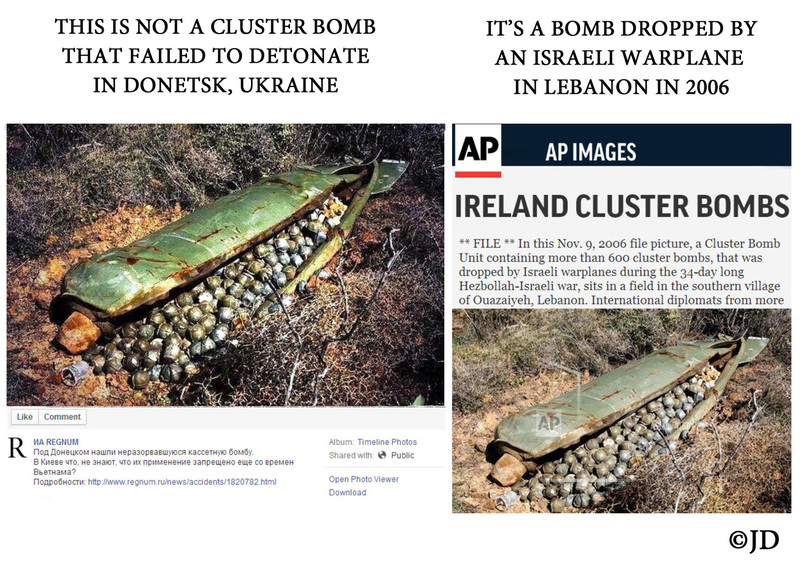 In reality, this is an AP photo, which depicts a cluster bomb used by the Israeli military in Lebanon, in 2006. Photograph of a burning wheat field was spread on the Internet along with the claim that the Ukrainian government is artificially creating a famine, by burning down the crops in Donbass, Ukraine. 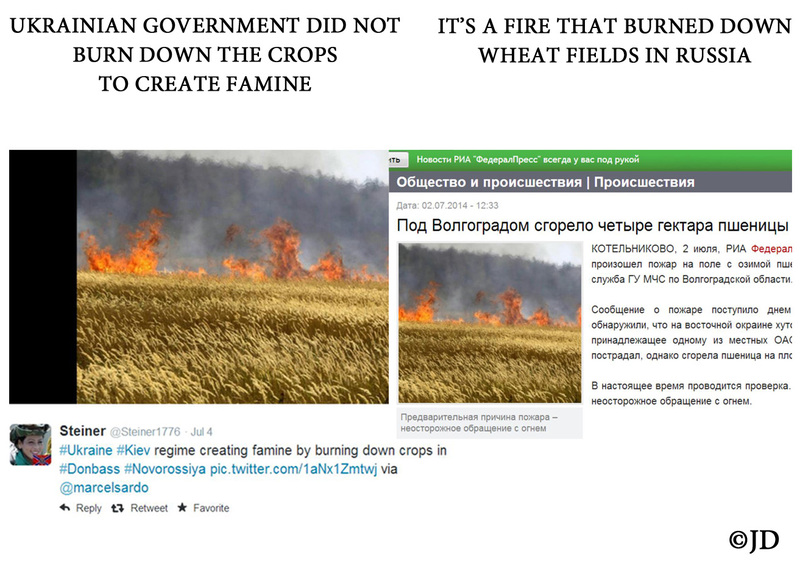 In fact, it’s a photo of a recent fire in the wheat fields of Russia’s Volgograd Oblast’. 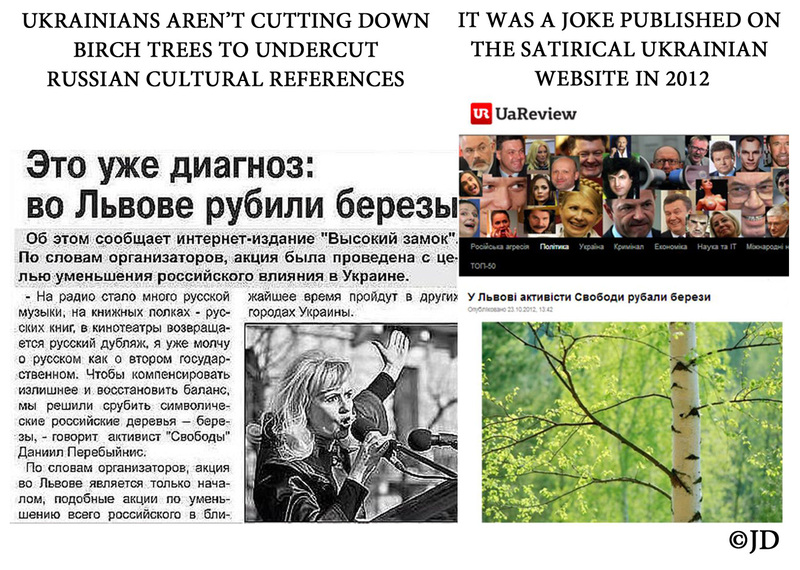 A joke, published on the website for the Ukrainian version of “The Onion” (UA Review) in 2012 was used to spin a ridiculous story in the Russian media, claiming that birch trees were being destroyed in Lviv, Ukraine to undermine Russian cultural influences on the population. Photo of a deceased little girl was widely circulated under the name of “Yulia Izotova,” along with poems and captions that blamed the Ukrainian military for her recent death in Slavyansk. In fact, the photo was stolen from the website mourning the death of Anastasia Luchishina, who was murdered by a sexual predator in Russia in 2013. Russian President Vladimir Putin lied to the press in an interview published by Russia Today (RT). 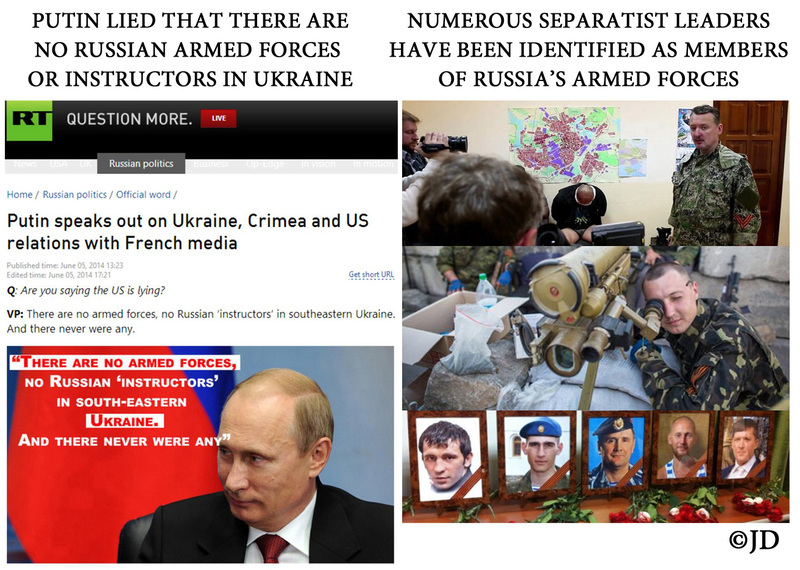 He claimed that “There are no armed forces, no Russian instructors in South-Eastern Ukraine. 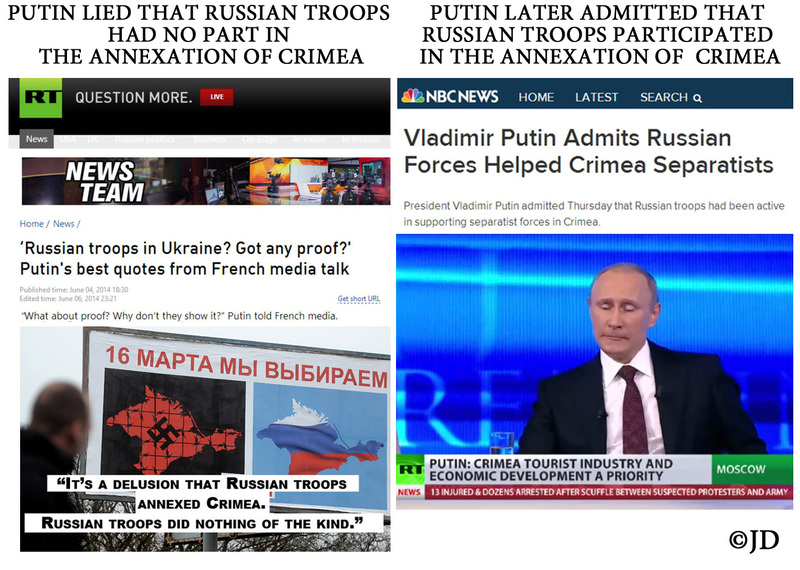 And there never were any.” These denials are similar to Putin’s false claims about Crimea. There is plentiful evidence, documenting active participation by the members of Russian armed forces in coordinating terrorist/separatist activities in Ukraine. Russia Today (RT) baselessly claimed that 400 U.S. mercenaries were deployed in Ukraine. In its irresponsible reporting, Russia Today referred to Blackwater and Academi interchangeably, claiming that the company’s personal was sent to Ukraine for a military operation. 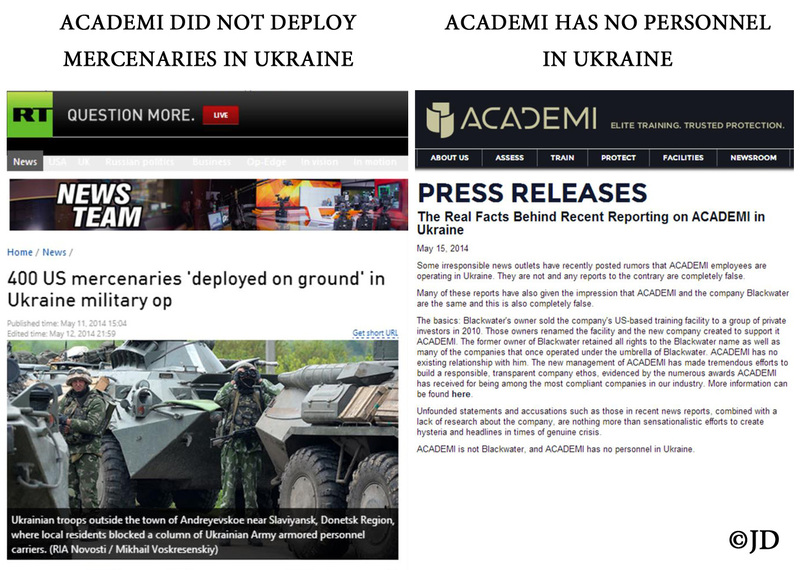 Academi strongly denied these allegations, stating that RT’s reporting was blatantly false, as the company had no personnel operating in Ukraine. Academi also pointed out that even basic fact-checking and accurate reporting would have been able to discern Blackwater from Academi. 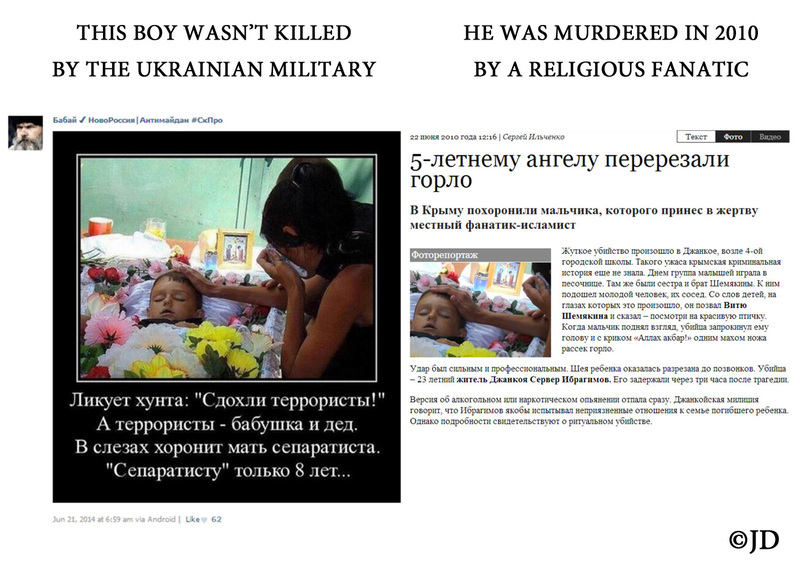 Widely circulated photograph of a little boy, allegedly killed by the Ukrainian military, actually depicts a young victim, murdered by a religious fanatic in 2010. 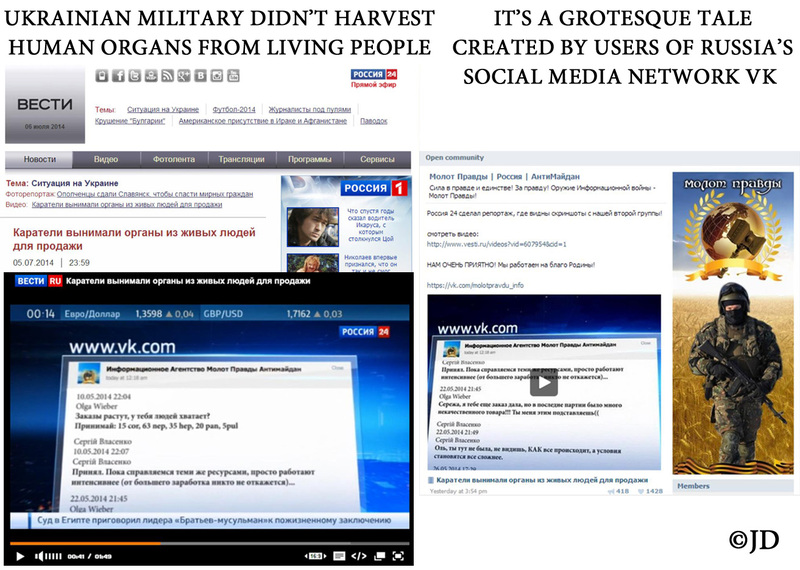 Russia’s mainstream media (channel Russia 24) actively disseminated an outrageous fabrication about an alleged organ-harvesting from living people by the Ukrainian military and foreign doctors. 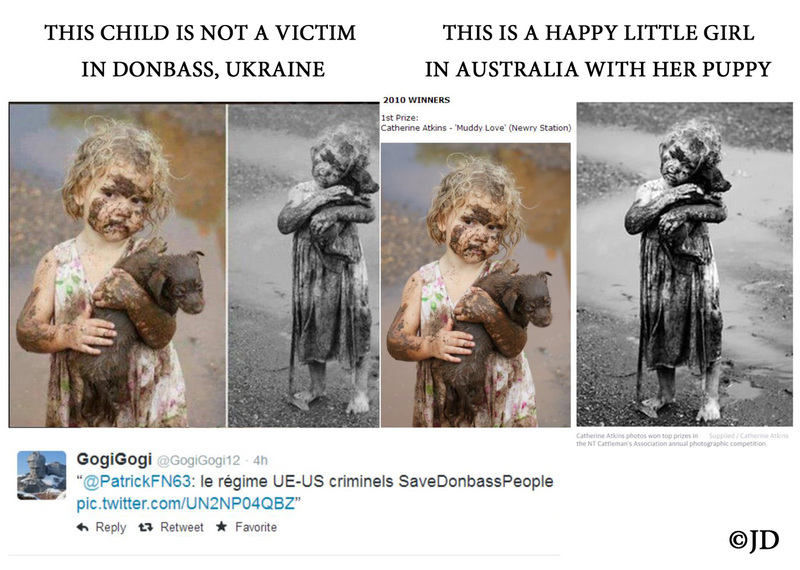 In fact, this grotesque fantasy was concocted on a Russian social media network, VK and has no basis in reality. 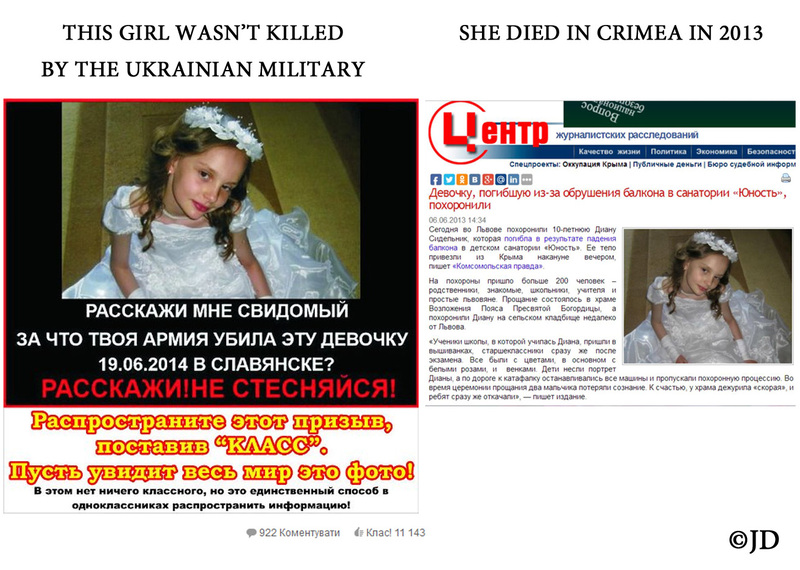 Photo of a little girl, allegedly killed by the Ukrainian military in Slavyansk, actually depicts a deceased child, who perished during an accident in Crimea in 2013. 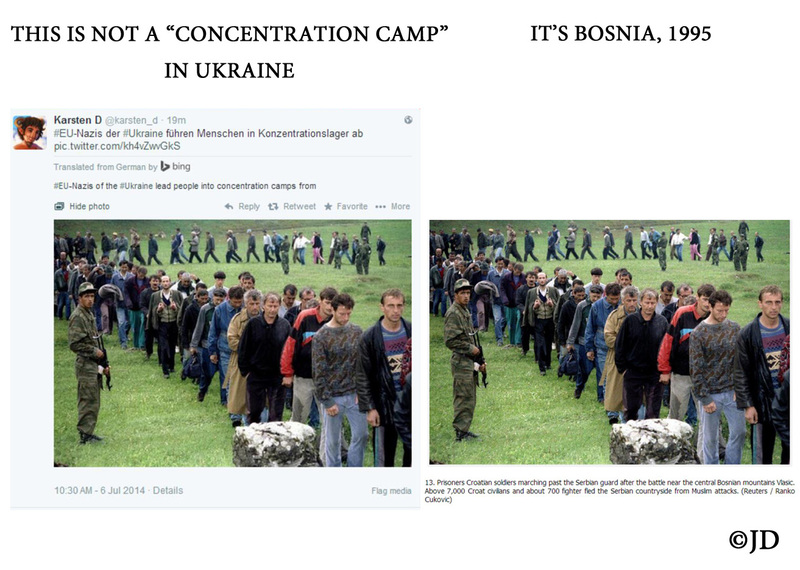 This is not an alleged “concentration camp” in Ukraine, but a photo depicting events in Bosnia in 1995. 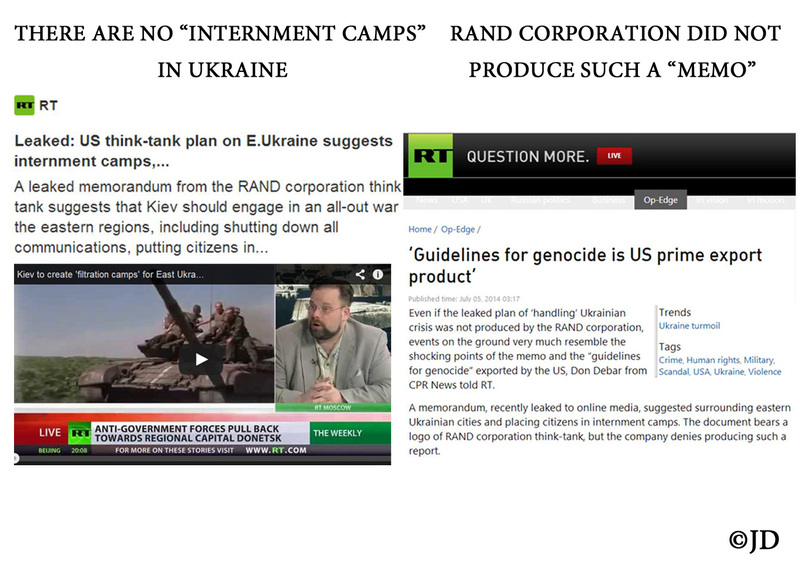 There are no concentration camps in Ukraine, in spite of sensational misrepresentations by the Russian media and public officials. This little girl is not an alleged victim of the Ukrainian military’s shelling in Donbass, Ukraine but an Australian child who adores her dog and loves to play in the mud. This photo of a little girl was falsely represented to have died because of the Ukrainian military’s shelling in Slovyansk. It was widely disseminated, including being posted by Viktor Baranetz, a columnist and a military observer for the Komsomolskaya Pravda. In reality, the picture in question depicts a child in Syria’s Alhurria hospital.